New York: Homai Vyarawalla (1913 – 2012) was India’s first female photojournalist and played a pivotal role in documenting India’s political history from the 1940s through 1970. Candid: The Lens and Life of Homai Vyarawalla, an exhibition of her photographs and related ephemera, opened at the Rubin Museum of Art in New York City on July 6 and is the first solo showing of her work in the United States. Unfortunately, she was not able to attend this exhibition, as she passed away in January at the age of 98. Vyarawalla was widely eulogized in India and abroad, including in the New York Times. Her presence as the first woman in a nascent profession like photojournalism (as it was in 1940s India) has often framed the discussion about her importance in India’s history. But her iconic status is equally deserved by her command over her craft, as is evident in the exhibition. The exhibition is organized thematically in clusters ranging from three to six images, around her personal photography, photojournalistic career post 1942, and commercial freelance work documenting the social life of Delhi in the late 1940s. 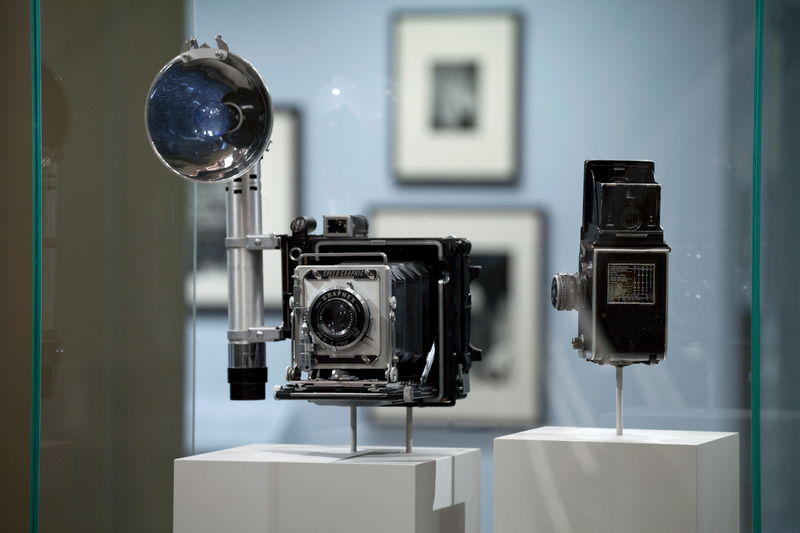 Entering the exhibition space, we are first welcomed by a showcase that holds Vyarawalla’s two favorite cameras – the Roleiflex and Speed Graphic Pacemaker – most commonly used at that time. The solidity of these cameras (in stark comparison to the sleekness of digital cameras today) immediately establishes the tone of the exhibition, setting us up for a trip down memory lane. This is further enhanced by the immediacy of viewing the medium of gelatin silver prints in the exhibition. The first set of photographs is from the 1930s, when Vyarawalla lived in Bombay and was a student at the Sir J.J. School of Arts. These predate her political photojournalism and capture everyday and mundane scenes in Bombay. These images are personal, subjective records of Vyarawalla’s Bombay – of VT Station, her classmate Rehana Mogul, and an expressive image of a monsoon-threatened Marine Drive. Many of these images were published in the weeklies of that time, particularly the Illustrated Weekly of India. Her later commercial work in Delhi chronicles the more elite social life of a city that was the center of politics in the 1940s. Two of these prints of parties at the Delhi Gymkhana Club have been included in the show. 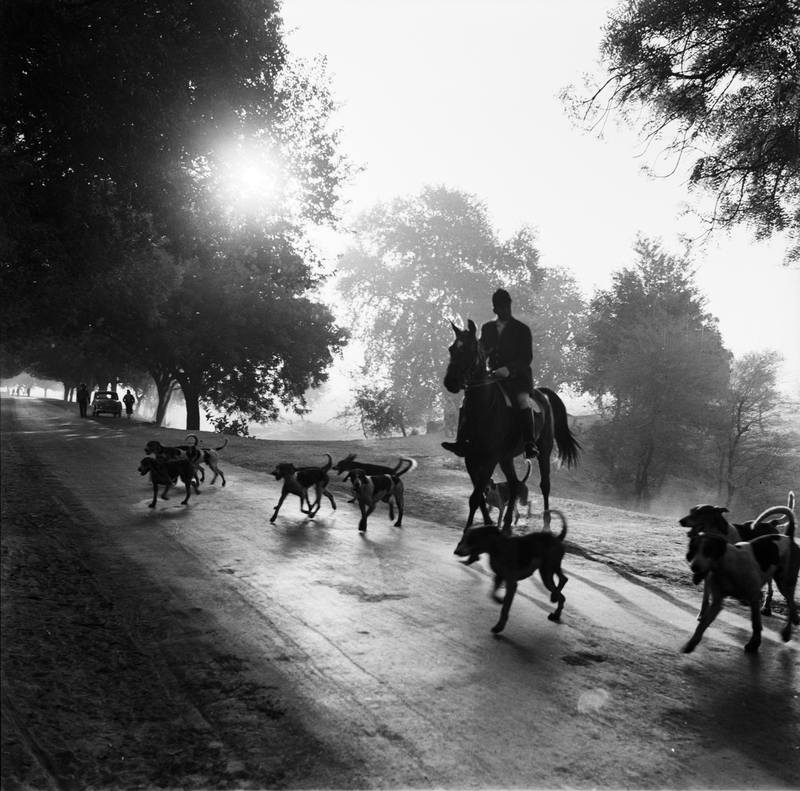 Out of this ‘non-political’ work, an exceptional photograph in the show is Fox Hunt. Shot in Delhi in the 1940s it is a moody, impressionistic take of a cold foggy morning in the city. Self-described as her favorite, this image exemplifies Vyarawalla’s ability to capture the atmosphere in which the moments she documented took place, suggesting a narrative instead of a sterile moment. This is true of her political photography as well. Vyarawalla moved to Delhi with her husband Maneckshaw, also a photojournalist, in 1942 where they were employed by the British Information Services. 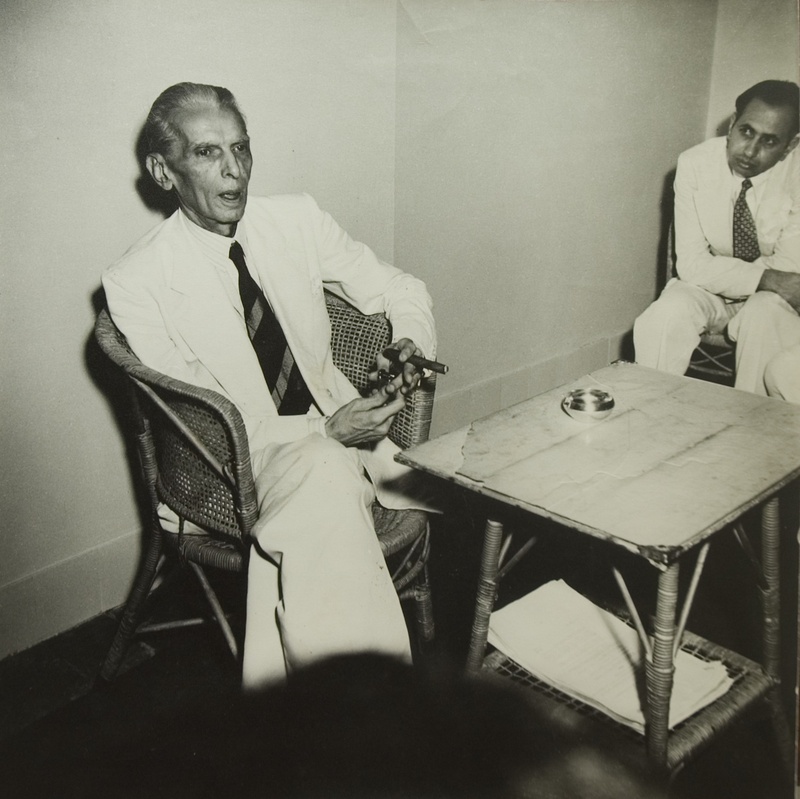 Her political photojournalism began with the end of the Second World War and India’s path to independence in the mid-1940s that are represented in the exhibition through images like her portrait of Mohammad Ali Jinnah. Present at seemingly every major event of the time, the next cluster of images is of the funeral and cremation of Mahatma Gandhi in 1948. 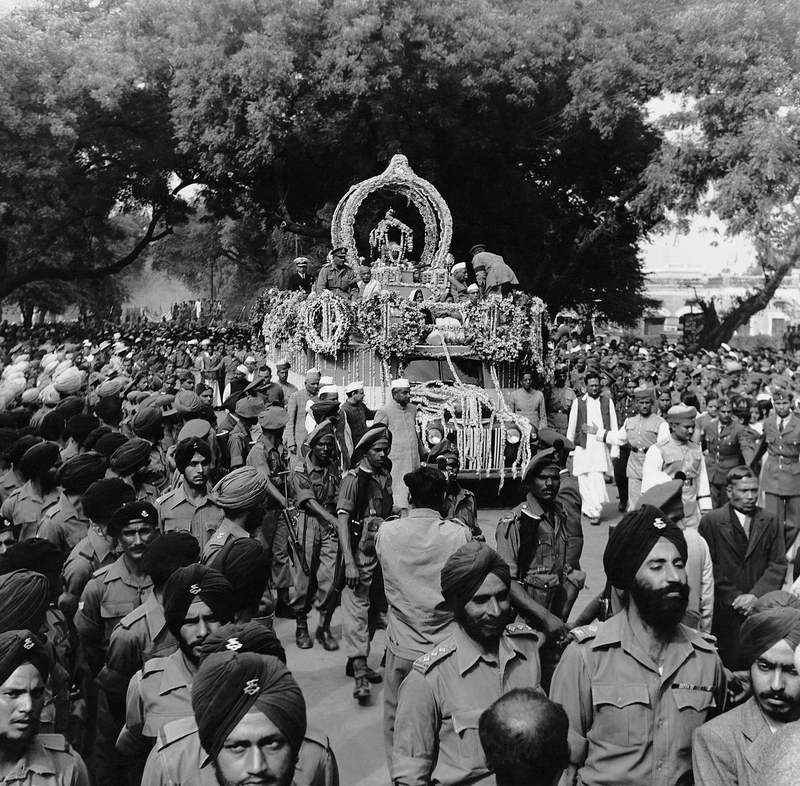 These include intimate images of the Mountbatten family and Gandhi’s funeral procession. The display then moves to Vyarawalla’s favorite subject: Jawaharlal Nehru, India’s first Prime Minister. 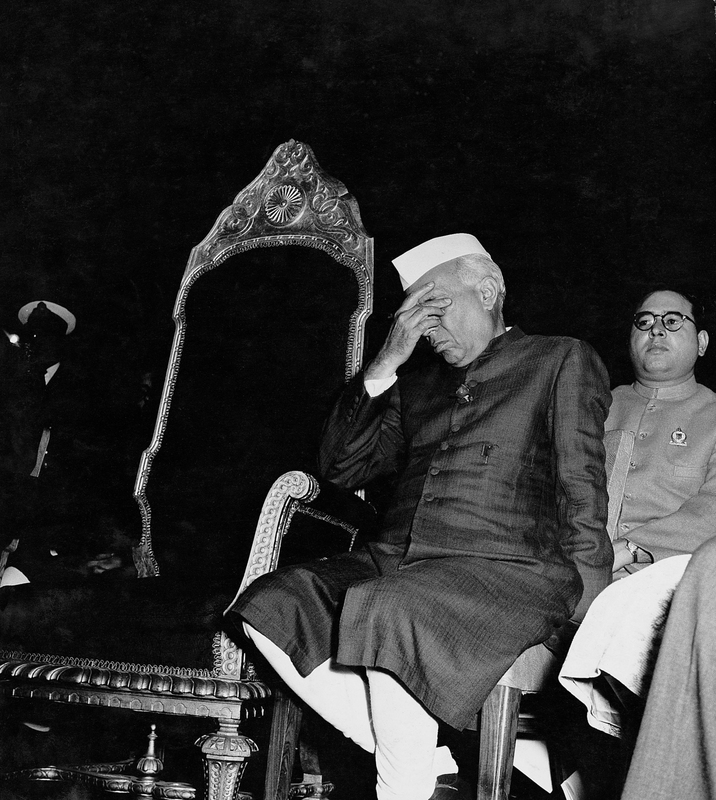 His pervasive presence in her photographs over his seventeen years in office underline this, and offer an organic portrait of him as a public figure – in jest, relaxed, caught in a lonely moment of exhaustion, and in his interactions with the many foreign dignitaries that visited India, his famed charm and charisma visibly occupying the frame. 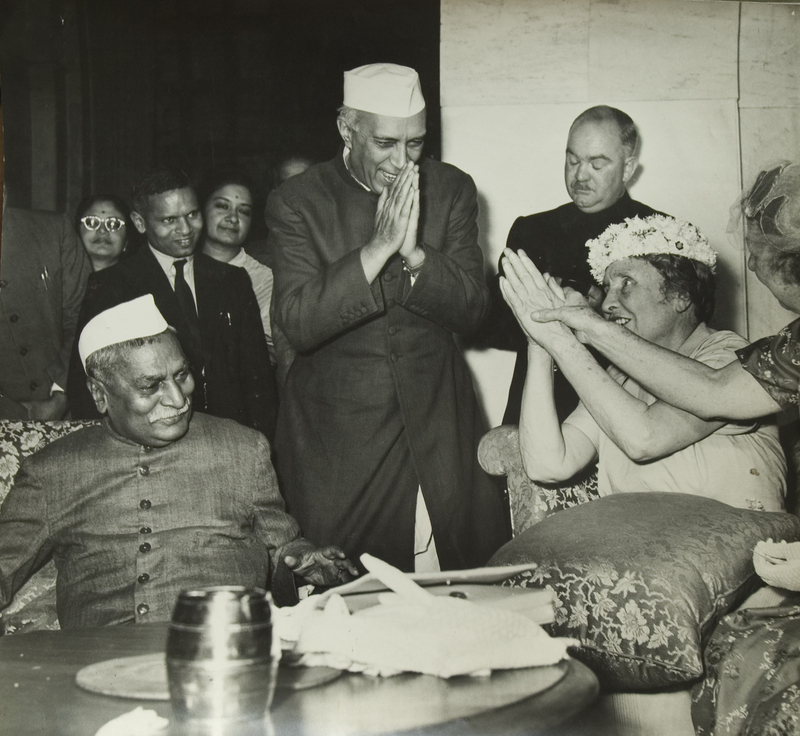 The public figures that visited independent India were also extensively photographed by Vyarawalla. I found this selection of images and their curation in the exhibition particularly strong. They document the ethos of India as a nation immediately after independence. 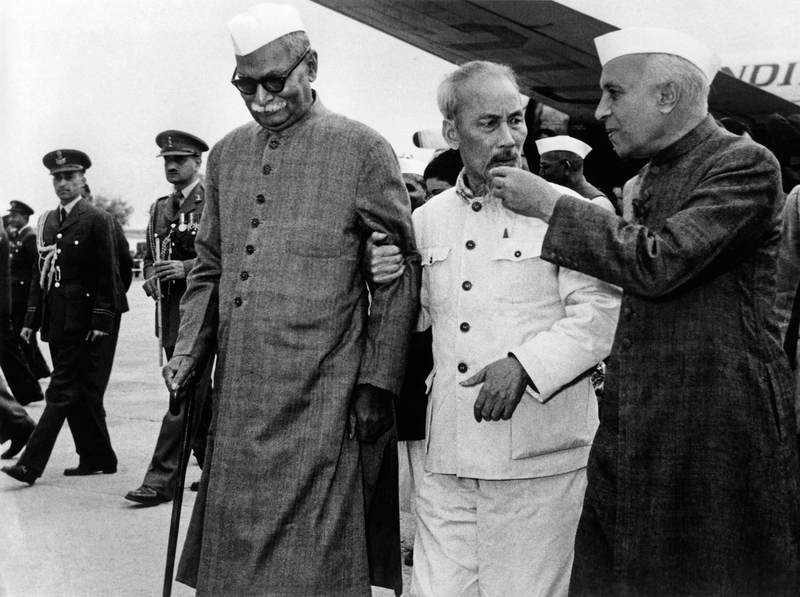 From Nehru’s playful interaction with Ho Chi Minh, at an otherwise grave political meeting, to meetings with Dr. Helen Keller, President Eisenhower, the Chinese Premier Chou En-lai in the days that the slogan ‘Hindi Chini Bhai Bhai’ was echoing around the country, all these feel like historical records of a new, exultant nation and the role it predicted for itself in the world. Vyarawalla’s eye almost always caught these figures in unguarded moments of ease, and her portraits lack the stiffness of predictable posed photographs. 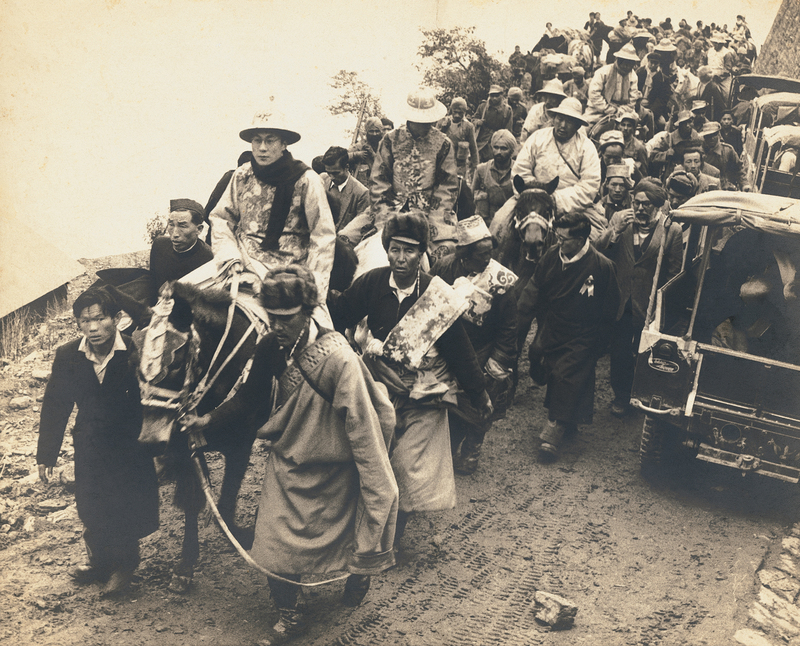 An image particularly relevant to contemporary India is of the Dalai Lama’s first visit in 1956. This was three years before his final, permanent escape to India and it is telling of her journalistic instinct that Vyarawalla chose to travel to Sikkim to photograph this occasion. What is striking in Vyarawalla’s works is that the perspective she chose in all her images is appropriate to the moment, be it the intimate framing of Mahatma Gandhi on his funeral pyre or the low angle shot of Nehru releasing a dove, making him larger than life. There is also a marked lack of sentimentality in her compositions as a press photographer. She had an ability to maintain distance and still capture the personalities of the subjects and the events. This made viewing her photographs an engrossing experience, allowing me to create portraits of the time she lived in and captured. In addition to her photographs, there are two other treasure troves in this exhibition. A showcase that spans the breadth of the gallery includes Vyarawalla’s contact prints from the 1940s through 1970. Also her press cards, hand colored Illustrated Weekly covers, invitations and thank you notes from the political figures she photographed – this case builds an image of the cultural life of Delhi during those years. Another gem is an excerpt from a documentary on her, directed by Anik Gosh and supported by Sparrow, where she is interviewed by Sabeena Gadihoke, her biographer (India in Focus: Camera Chronicles of Homai Vyarawalla, Mapin/Parzor, 2006) and a collaborator on this exhibition. Sprightly and undiminished, Vyarawalla speaks freely – on her beloved cameras, her courteous male colleagues of yore, the remarkable integrity of that time and most importantly, her method. She says, and I paraphrase, that there was no time to focus. ‘We had to put our distance, fit the picture and just click’. This exhibition is presented in collaboration with the Alkazi Foundation for the Arts, New Delhi, and will remain on view till January 14, 2013. A larger retrospective of Vyarawalla’s work was held in 2010-2011 at the National Gallery of Modern Art, in New Delhi and Mumbai. A rare opportunity to view these images in person in New York, the show is definitely worth a dekko. Located in the museum’s Theater Level Gallery, admission to it is free of charge, a fact the show’s curator Beth Citron said Homai Vyarawalla would especially have been pleased with in an earlier interview with Saffronart.